Cell phones as a substitute for home Internet service? That’s what the Federal Communications Commission (FCC) suggested in an August 2017 document. Buried within the Notice of Inquiry for the Section 706 Report, the FCC quietly proposed that mobile service could be considered broadband deployment. In a recent article, Jon Brodkin at Ars Technica dove into why that suggestion is laughable. Mobile Internet service, especially at speeds less than 25 Megabits per second (Mbps) download and 3 Mbps upload, is not equivalent to high-speed home Internet service. This proposal also raises concerns for rural communities exploring funding options. If the FCC treats mobile Internet access as broadband deployment, rural areas will suddenly look better connected. On paper, the FCC statistics will show that rural America has sufficient Internet access, but the reality in the trenches will remain as it is today - poor connectivity in many rural communities. A similar situation has already happened in Iowa, where the inclusion of satellite Internet service is now considered broadband access. 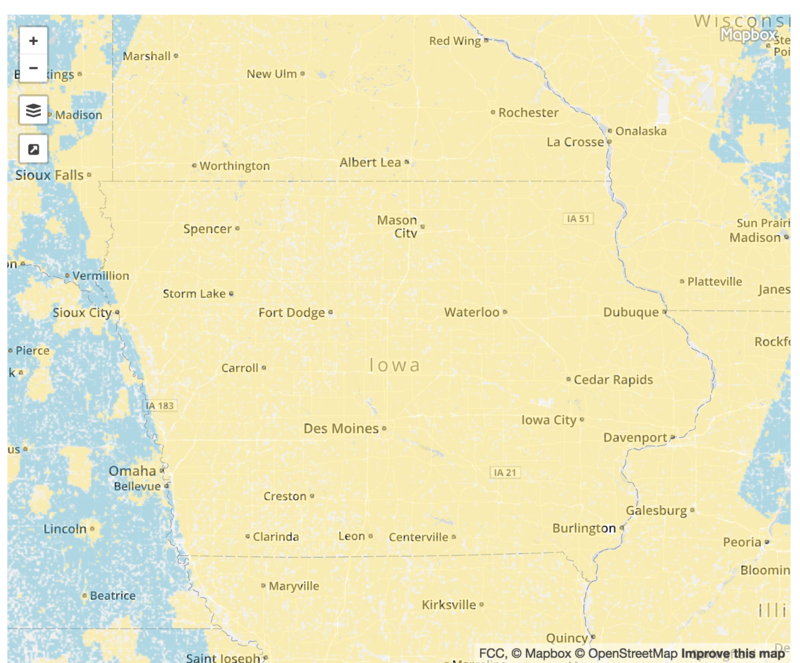 The interactive FCC 2016 Broadband Deployment Map clearly shows that almost all of Iowa has high-speed Internet access via satellite. One can use satellite service to browse the web, but it has significant limitations, especially when uploading data. One of the most recurring complaints about cable television is the bundles - people resent having to pay for channels that they do not watch. Especially when those cable prices go up consistently. The cable companies tend to absorb most of the blame and anger for this model, but they aren't entirely responsible. To explain how the cable industry works, Public Knowledge Senior Counsel John Bergmayer joins us for Episode 241 of the Community Broadband Bits podcast. We talk about overlapping monopolies, market power, and how the cable companies themselves are somewhat imprisoned by content owners. As fits with our focus, we also talk specifically about how smaller firms (which includes all municipal networks) are particularly harmed by the status quo and even more harmed by the ongoing consolidation of the largest cable companies becuase they then have far greater negotiating power. This show is 30 minutes long and can be played on this page or via iTunes or via the tool of your choice using this feed. Seattle has received a lot of attention as it's struggled with the concept of a community network, but people in the small community of Brinnon are moving past the talking phase. A group of residents are tired of waiting for high quality Internet access and don't expect a national provider to bring it to them any time soon. People in Brinnon are considering a fixed wireless approach pioneered in the San Juan Islands, which is a few hours north. Community members have formed a nonprofit, West Canal Community Broadband Project, to bring wireless Internet service to the town and neighboring communities. Two hundred people have already signed up on the nonprofit’s website. The community is located about 25 miles due west (62 miles by car to get through the Sound) and home to about 800 people. People in Brinnon with the best connections have DSL, but many use satellite or mobile Internet access. Data caps associated with satellite and mobile plans drive up the costs and neither source is reliable. With such a small population, the locals don't expect any incumbent investment soon; they're exercising their self-reliant muscles and hashing out the details of better local connectivity on their own. If all goes as planned, Brinnon could see better Internet access options by next summer. The community center and the school have high-speed Internet service thanks to a federal grant project in Jefferson County, but residents and businesses struggle to connect. The goal of this wireless project is fast, reliable Internet service without data limits for both business and residents. The residential download speed will be 25 Megabits per second (Mbps), and business connections will have speeds of 50 Mbps. Customized plans with speeds of up to 250 Mbps will also be offered. No word yet on expected upload speeds. The cost for each tier of service has not yet been decided. Volunteers in Shutesbury will fan out this weekend to perform a "pole inventory blitz" reports the GazetteNet.com. The town of approximately 1,800 people sits near Leverett and faces many of the same difficulties with connectivity. Shutesbury and Leverett were working together a few years ago hoping to develop a solution to bring infrastructure to both communities. The two communities approached Verizon and Comcast asking for better connectivity, but their requests led to nothing. Eventually, Leverett became frustrated and broke out on their own. They are now deploying their own fiber network. Get updates to this story here. With Senate Bill No. 304 [pdf], the Kansas Legislature will consider a bill to revoke local authority to build networks. If passed, this bill would create some of the most draconian limits on building networks we have seen in any state. The language in this bill prohibits not only networks that directly offer services but even public-private partnerships and open access approaches. This is the kind of language one would expect to see if the goal is to protect politically powerful cable and telephone company monopolies rather than just limiting local authority to deliver services. encourage the development and widespread use of technological advances in providing video, telecommunications and broadband services at competitive rates; and ensure that video, telecommunications and broadband services are each provided within a consistent, comprehensive and nondiscriminatory federal, state and local government framework. Yet the bill does nothing but discourage investment, with no explanation of how prohibiting some approaches will lead to more investment or better services. It does not enable any new business models, rather it outlaws one possible source of competition for existing providers. The bill contains what will appear to the untrained eye to be an exemption for unserved areas. However, the language is hollow and will have no effect in protecting those who have no access from the impact of this bill. The first problem is the definition of unserved. A proper definition of unserved would involve whether the identified area has access to a connection meeting the FCC's minimum broadband definition delivered by DSL, cable, fiber-optic, fixed wireless or the like. These technologies are all capable of delivering such access. The Logan Journal recently reported that the Russellville Electric Plant Board (EPB) now offers gigabit service to local businesses. The article notes that Net Index, an online tool to measure download and upload speeds, recognizes EPB as the first Gig city in Kentucky. To learn more about the community and its network, we talked with Robert White, General Manager of EPB. The community of 7,000 is the county seat of south central's Logan County. Russellville is located in the center of several other larger communities: Nashville, Bowling Green, Hopkinsville, and Clarksville, Tennessee. Manufacturing has been a large part of the local economy for generations, but community leaders recognize the vulnerability of a narrow economic base. In order to encourage a versatile economy, Russellville invested in its telecommunications utility. The community wants to encourage small business while simultaneously providing manufacturers the connectivity they need. Leadership sees the ability to remain competitive directly tied to their network. In addition to the economic development opportunities a fiber network can provide, communities like Russellville rely on electricity revenue from large consumers. Retaining the large electric consumers that also provide jobs in the community is a must. Russellville's electric utility created a strong advantage when it was time to venture into telecommunications. EPB had already established a strong relationship with its Russellville customers, says White, and locals felt they could trust their municipal electric provider. Rural Broadband Association to FCC: "Satellite Is Not Broadband"
The Rural Broadband Association (NTCA) recently filed a report with the FCC as it examines the role of the Universal Services Fund (USF) in communications. Telecompetitor reports that NTCA filed the report as part of comments on November 7, 2013. The report by Vantage Point telecommunications engineering firm criticizes the argument that satellite is a magic pill for rural broadband availability. You can view a PDF of the report at FCC.gov. While satellites will continue to provide an important role in global communications, satellites do not have the capacity to replace a significant amount of the fixed wireline broadband in use today nor can they provide high‐quality, low‐latency communications currently available using landline communication systems. While recent advances have increased satellite capacity, the capacity available on an entire satellite is much smaller than that available on a single strand of fiber. The FCC has previously stated that as it transitions today’s voice-focused Universal Service Fund to focus instead on broadband, it envisions that homes in the areas that are most expensive to serve would receive broadband from a satellite (or possibly broadband wireless) provider. And depending how far the FCC is able to stretch its limited pool of USF dollars, it wouldn’t be surprising for the commission to consider expanding the number of homes targeted for satellite service – a move that eventually could leave some NTCA members without USF funding. We are back with the fourth volume of our responding to "Crazy Talk" theme on the Community Broadband Bits podcast. The source of this week's crazy talk is a public relations executive for Time Warner Cable, following an interview I did on WUNC in North Carolina. Lisa Gonzalez, myself, and our colleague John Farrell react to some of the claims made to discuss what you should know about community owned networks and broadband policy more generally. We talk about misleading statistics, lies about how local governments fund networks, and whether Time Warner Cable or local utilities pay more in taxes. Thanks to Mudhoney for the music, licensed using Creative Commons. Wireless networks have been incredibly successful, from home Wi-Fi networks to the billions of mobile devices in use across the planet. So successful, in fact, that some have come to believe we no longer need wires. We developed this fact sheet to clarify some misconceptions about what wireless Internet networks are capable of and the importance of fiber optic cables in building better wireless networks as our bandwidth needs continue to increase. This fact sheet defines important terms, offers some key points clarifying common misconceptions, compares 4G and 3G wireless to wired cable, and more. We also include references to additional resources for those who want to dig deeper. Download our Wireless Internet 101 Fact Sheet Here [pdf]. If you want updates about stories relating to community Internet networks, we send out one email each week with recent stories we covered here at MuniNetworks.org. Sign up here. Leverett, Massachusetts' broadband initiative has moved to the next phase in bringing fiber to residents. The town selectboard recently decided on a bidder to build the community owned network. G4S designed the network and also works with the Massachusetts Broadband Institute (MBI) as it brings a middle mile fiber network to towns across the western half of the state [PDF of service area]. Indeed, after years of trying to convince private business to develop and offer high-speed telecommunication service in rural western Massachusetts, Leverett’s first-of-its kind network is being built with the help of a $40 million state bond, $47 million in federal stimulus funding and the town’s willingness to borrow to build infrastructure to attract service. D’Errico said the cost of the project should be lower than $300 a year per median $278,000 property owner over 20 years. ...D’Errico said the $300 annual tax addition for the median value property is likely far lower than what residents are paying for their telephone, satellite dishes and cable service connections, and that having the town own the infrastructure likely means that the service contracts should also be a fraction of what they would cost otherwise. Before construction can start, utility poles will need to be made ready for placement of the fiber optic cable. While this stage of the prep work is expected to take up to six months, hanging the cable would only take about three months.